Ever since Rachelle from Pantry Eats shared her recipe for Crock Pot Bread last week, I have been intrigued by the concept of making yummy, homemade bread in the crock pot. And since Wednesday night rolled around, and I’d given no thought whatsoever to what my own contribution would be this week, I decided to give it a go. As I wasn’t entirely sure where my yeast got to, beer bread seemed the thing. I looked around for an existing recipe, but couldn’t find much. 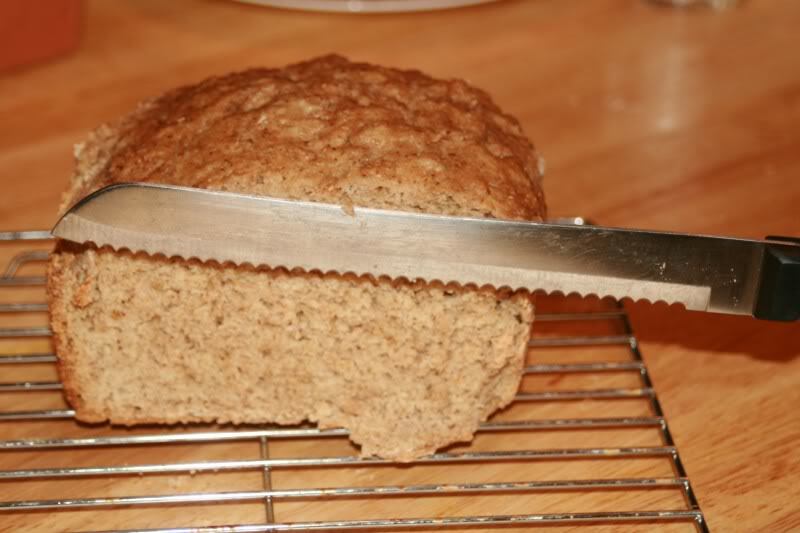 So I wound up adapting my recipe for Whole Grain Beer Bread and dumping it in the crock pot. It was a huge shock when it came out looking like proper bread (despite the random oval shape from the crock). It was lovely fresh out of the pot with butter. Preheat your crock pot to high. Some of the recipes I saw talked about putting some other container in there. Some said raise it. Some didn’t. I didn’t have a container that would fit in my big crock pot, so I just used my 4 quart one and greased it well. Press the dough (which should be sticky) down into the crock so that it sits evenly. Kelly from Evil Shenanigans has been sick lately. Soup is, of course, the go to food for all illness, and since she didn’t feel like doing a lot of chopping and prep, she turned to her Crock pot and made a fabulous looking Chicken Tortilla Soup. 5 minutes of prep, a long nap, and voila, fabulous, fragrant soup. Thanks for visiting, and please spread the word and contribute your recipes to the next Thoughtless Thursday Roundup! I am so happy your crockpot bread turned out great. Evil Shenanigans has the same cure for illness as me. I love a eye watering spicy taco soup when I am all stuffed up. I make jalapeno cheese bread to eat with chicken tortilla soup. it will chase away whatever ails me.!! Ooo yum. Do you have a good recipe for it?